The Liberian mongoose weighs about 2.3 kg (5 lb). It is believed to be restricted to low-lying areas and stream banks in overgrown, old secondary forest and in deciduous rainforest growing on deep sandy soil (Schreiber et al. 1989; Kingdon 1997) . The Liberian mongoose eats earthworms and beetle larvae found in streambeds, low-lying areas and dead palm trunks. People living in areas where it has been found state that it is diurnal and terrestrial. Others say that it is a good climber and is frequently found in tree holes. Native people say that it lives in groups of 3 - 5 individuals (one troop of 15 has been recorded). In 1990 it was thought to occur in a small area of northeastern Liberia, and possibly also in Cote d'Ivoire, Guinea and Sierra Leone. It was relatively well known in villages in several counties in Liberia, but generally reported to be rare and declining. It is currently known only from the upper reaches of the Cess River valley in Liberia and from Tai National Park in Cote d'Ivoire (Kingdon 1997) , and in Guinea (IUCN 2000) . The Liberian mongoose is heavily hunted for food by people living in the same area. It is easily approached and captured when digging for worms. It is also affected by deforestation for agriculture, logging and mining. *** The first dead specimens of the Liberian mongoose were obtained by scientists from local hunters in 1974. The first live animal was caught by scientists in 1989. In Cote d'Ivoire, the first carcass was obtained by scientists in 1997. *** The Liberian mongoose has long claws and a long snout with small teeth, suggesting that it is mainly insectivorous. *** The Liberian mongoose may be outcompeted by the related cusimanse (Crossarchus obscurus) outside its optimum habitat. In 1990 it was thought to occur in a small area of northeastern Liberia, and possibly also in Cote d'Ivoire, Guinea and Sierra Leone. It was relatively well known in villages in several counties in Liberia, but generally reported to be rare and declining. It is currently known only from the upper reaches of the Cess River valley in Liberia and the Tai National Park in Cote d'Ivoire (Kingdon 1997) , and in Guinea (IUCN 2003a) . 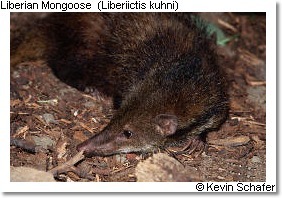 The Liberian mongoose weighs 2 - 2.3 kg (4.4 - 5 lb). The Liberian mongoose is believed to be restricted to low-lying areas and stream banks in overgrown, old secondary forest and in deciduous rainforest growing on deep sandy soil, where it digs for earthworms and beetle larvae (Schreiber et al. 1989; Kingdon 1997) . The Liberian mongoose eats earthworms and beetle larvae found in streambeds, low-lying areas and dead palm trunks. People living in the area where it has been found state that it is diurnal and terrestrial. Others say that it is a good climber and is frequently found in tree holes. Native people say that it lives in groups of 3 - 5 individuals (one troop of 15 has been recorded).